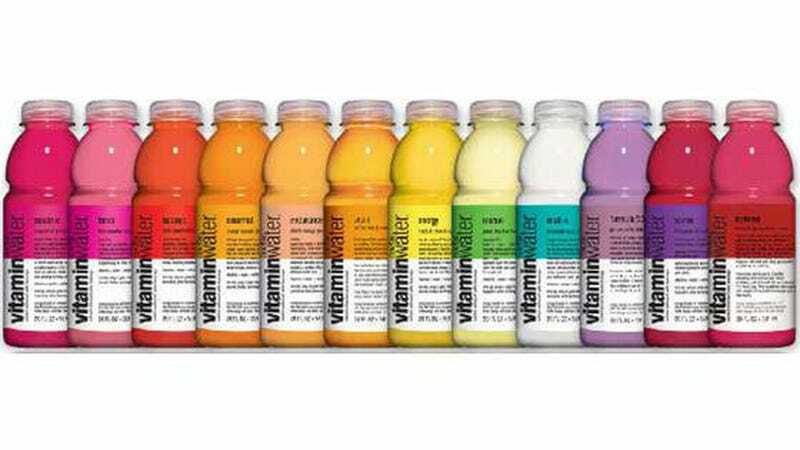 Vitaminwater is still in hot (neon-dyed sugar) water over its claims that its anything other than Obesity in Landfill (tm?) — and it looks like they're finally going to see their day in (class action lawsuit) court. It all started in January of 2009, when consumer advocacy group, the Center for Science in the Public Interest, and consumers in New York and California first filed a lawsuit, "alleging deceptive labeling and marketing for the soft drink, which included claims that the drink could reduce rise for eye disease, promote healthy joints and support 'optimal immune function.'" Now, U.S. Magistrate Judge Robert M. Levy recommends that the plaintiffs can litigate for declaratory and injunctive relief, but not for damages. The marketing of vitaminwater will go down in history as one of the boldest and brashest attempts ever to affix a healthy halo to what is essentially a junk food, a non-carbonated soda. Vitaminwater, like Coca-Cola itself, promotes weight gain, obesity, diabetes, heart disease, and cannot deliver on any of the dishonest claims it has made over the years. We are very gratified that Magistrate Judge Levy recommended denying class certification as to all monetary damages claims alleged by plaintiffs. We firmly believe the plaintiffs' claims are without merit and will ultimately be rejected. Vitaminwater is a great tasting, hydrating beverage with essential vitamins and water—and labels clearly showing ingredients and calorie content. It's worth noting that Vitaminwater was a pretty small company — then upstart beverage company Glaceau — until they did that game-changing deal with 50 Cent and exploded everywhere. Then, Coca-Cola bought them, and here we are. This will be an interesting case to follow.